From the beginning of the era of air passenger transportation Great Britain held a leading position in the world market. Before World War II, and even earlier, the huge flying boats of the Empire carried out transcontinental flights, bringing passengers to the most remote corners of the world, where the country continued to possess numerous colonies and dominions. War slowed down the world's passenger traffic for almost 10 years, however in the mid-1940s it was clear that there would come an era of wholly transformed air transportation, one available to many sectors of society and not only the rich, and considerably greater volumes and frequencies of flights. These factors demanded the creation of essentially new types of aircraft. In 1946 the leading British airline B.O.A.C. and the special government commission issued to aircraft manufacturers the MRE ("Medium Range Empire") requirement. 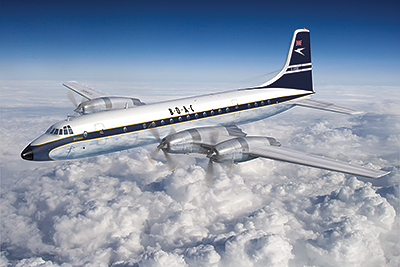 Initially, all projects including possible license production of the American Lockheed Constellation, were rejected, because of insufficiently meeting the specifications. However, the Ministry of Supply in an initiative allowed the Bristol firm to continue to develop their Type 175 project. The plane had to transport 48 passengers, weighing 47 tons. The new Proteus engines were expected to give the machine very good characteristics, but at that time they were not perfected. Eventually, B.O.A.C. showed interested in the plane. The first aircraft were planned to be introduced in 1954, and the first flight of the plane, now named Britannia, took place in August, 1952. Its flight characteristics were even better than expected, and B.O.A.C. already had plans to take on the Britannia as its flagship type, although the world's first passenger jet the De Havilland Comet had just appeared, causing the carrier to be cautious because of the imperfection of work on several systems of the Britannia. Apart from B.O.A.C., other leading carriers, including the prestigious KLM, the oldest airline, became interested in the new design. The accidents of two prototypes built during 1952-1953 were a regrettable surprise for all. In due course, testing of the first production machine was completed, and the terms of transfer of planes to airlines were thoroughly checked. In 1956 there was an accident with another machine during crew training, and therefore the first operational flights of the Britannia commenced only at the beginning of 1957. Overall 86 machines of this type were built, the main operator of most of which was B.O.A.C., but constant problems with the normal operation of the Proteus engine were fatally damaging for the prospects of the aircraft. In 1959 the epoch-making Boeing 707 surged onto the arena of world air transportation, in the face of which all other piston and turbo-propeller transcontinental planes promptly faded into the background. The fate of the Britannia, which for its comfort was loved by a great number of passengers, was decided. It continued to be used on medium-haul air routes for some years, and many machines were sold to other countries - to Argentina, Israel, Canada, Switzerland, Cuba, Spain, Mexico and others. Some planes were converted to transports, and in Canada the Canadair firm made its own version of the Britannia under license, employing a number of different methods of construction. The last planes of this type could still be found flying in the early 1990s, that is, almost half a century after their construction. The Britannia, which had failed to become the leader of world transcontinental air transportation, in a twist of fate repeated the destiny of Great Britain as a country which in the post-war years lost its position at the head of the field of passenger aircraft, finally conceding sole leadership to the United States of America.